The “new” sink we installed in the RainyDayKitchen at the beginning of the month is working out great. Unlike the old porcelain sink, the stainless steel sink had three pre-cut openings for things like a soap, instant hot water, or a filtered-water dispenser. We had asked RainyDay readers which project would be of the most interest. 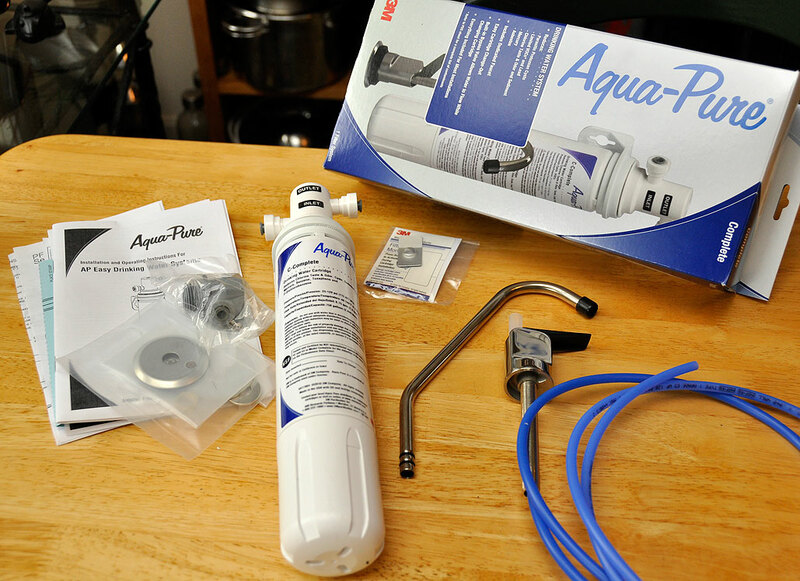 The installation of an under-sink water filtration/purification system was the clear preference and the systems mentioned most often by name was Aqua-Pure by 3M. So today, we are going to take a FirstLook at the AP-DWS1000 and AP Easy from Aqua-Pure. Later in October, we’ll show you how easy it is to install one of these under-sink systems. While many may recognize 3M as the maker of Scotch Tape and Post-it Notes, they are actually much bigger than just those two brands. 3M is a hugely diversified technology company with a global presence in electronic, health care, home, office, and many other sectors. With 100+ years of history and over $20B in annual sales, when 3M purchased CUNO in 2005, they acquired a company with a leadership position in water filtration and purification. 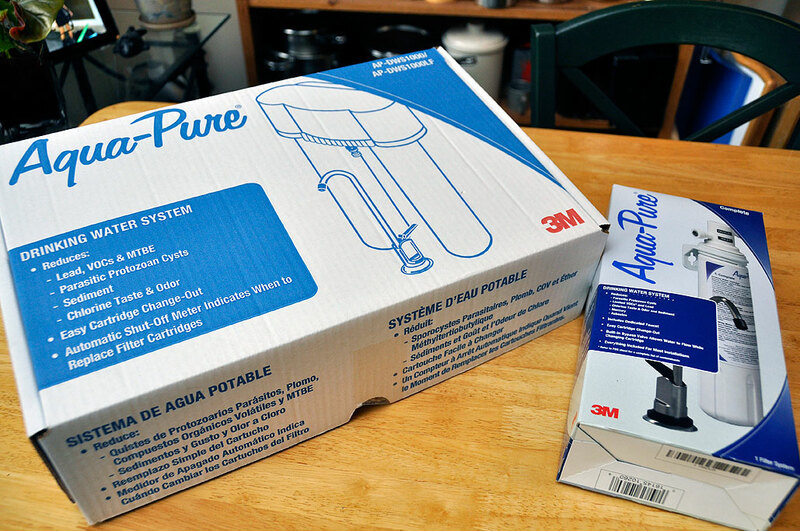 CUNO’s (now 3M) Aqua-Pure Water System is typically used in the kitchen to remove chlorine taste and odor from the cold water coming out of the faucet. Stage 1 – reduces lead, chlorine, and sediment, and enhances taste/odor. Stage 2 – reduces trihalomethanes (THMs)*, volatile organic chemicals and microscopic cysts. 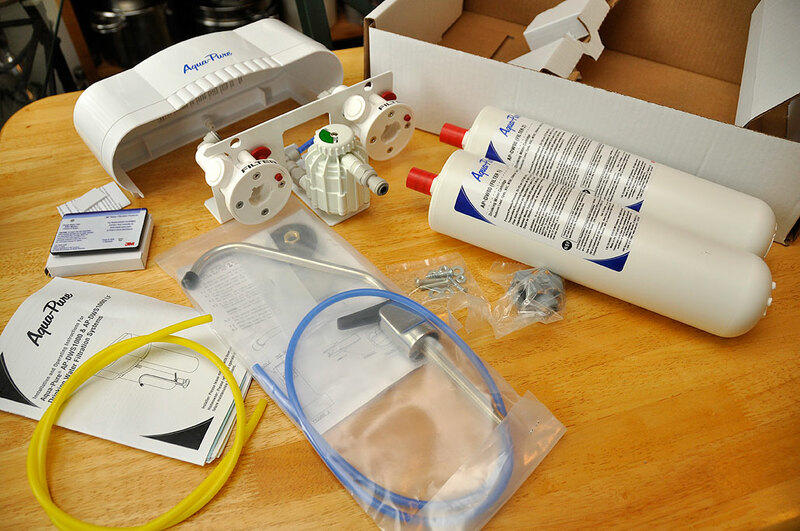 The APDWS1000 comes with a lead-free faucet, installation hardware, pipe connections and a built-in monitoring device that shuts off the water to remind you to change the cartridge. The Aqua-Pure AP Easy is a single-filter system which is newer and more advanced than the AP-DWS1000. This system has a built-in bypass valve which eliminates the need to shut off the water when replacing the filter cartridge. Like the AP-DWS1000, the AP Easy Complete comes with a dedicated faucet. Check out the table below for a full comparison of the two systems. Reduction Claims Chlorine, taste and odor, particulates, cyst, lead, MTBE and more than 50 nos. of VOCs. Chlorine, taste and odor, particulates, cyst, lead and 8 nos. of VOCs. Note:The frequency of changing the cartridge varies, depending on the water usage and quality. The cartridges should be changed once the flow of water slows down. Point-of-use filtration systems such as these Aqua-Pure units are a more convenient and less expensive alternative to bottled water. They don’t take up room on the kitchen counter and are always available. The systems look quite easy to install, but we’ll have more to say about that after we have it in place. Look for the write-up at the end of Fall.